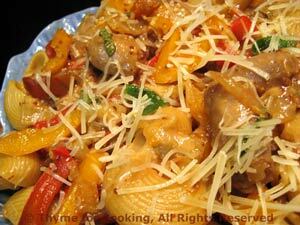 Easy Dinner from Thyme for Cooking: Warm Pasta Salad with Peppers, Sausage. You can do this indoors, as I did, or do the peppers, onion and sausages on the grill. Summer cooking is easy.